Depositing your data in an archive or repository will facilitate its discovery and preservation, and facilitate proper citation. Informal methods of providing your data, such as emailing it to a colleague or posting a file on a website, are not the same as sharing your data in a way that makes it easy for other researchers to find your data. Repositories are maintained by many academic discipline communities, by funding agencies to provide access to funded research, and by academic institutions to protect community member research. Many repositories assign data identifies to your data (e.g., DOI, PURL, Handle.Net, etc.). If you are looking for a repository to archive and share your data or looking for archived data to reuse, the Registry of Research Data Repositories (re3data.org) and the Data Repository listing on the Open Access Directory Wiki are two excellent places to start. Note: Not all repositories can ensure long-term preservation of your data; always contact the repository for details before submitting your data. 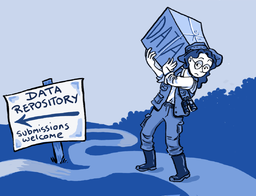 Some journals such as Nature, Science, and PLoS ONE require authors to make all supporting data available to readers. Check journal policies and author guidelines prior to submitting your article to any journal for publication. From the MIT guide on Data Management. Part of the Simmons College Open Access Directory wiki.